TIME and Felix & Paul Studios' modified Z CAM VR camera on the International Space Station. The camera will be used to film the ISS Experience, an immersive documentary series that will feature the first cinematic virtual reality spacewalk. PARK CITY, Utah — What if you could visit the International Space Station, join its crew for their daily activities and even go outside on a spacewalk — all without having to leave your home, let alone the ground? TIME immersive experiences editorial director Mia Tramz, TIME executive producer Jonathan Woods, CASIS associate ISS program scientist Liz Warren and Felix & Paul Studios creative director Félix Lajeunesse announced The ISS Experience at the Sundance Film Festival in Park City, Utah on Saturday, Jan. 26, 2019. 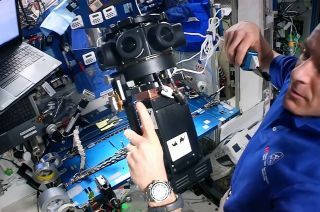 Expedition 58 flight engineer David Saint-Jacques unpacks one of two Z CAM cameras delivered to the International Space Station in December 2018, prior to using it to capture the first scene for The ISS Experience on Friday, Jan. 25, 2019. See the mission patch and watch the trailer for Time and Felix & Paul Studio’s The ISS Experience at collectSPACE. Follow collectSPACE.comon Facebookand on Twitter at @collectSPACE. Copyright 2019 collectSPACE.com. All rights reserved.